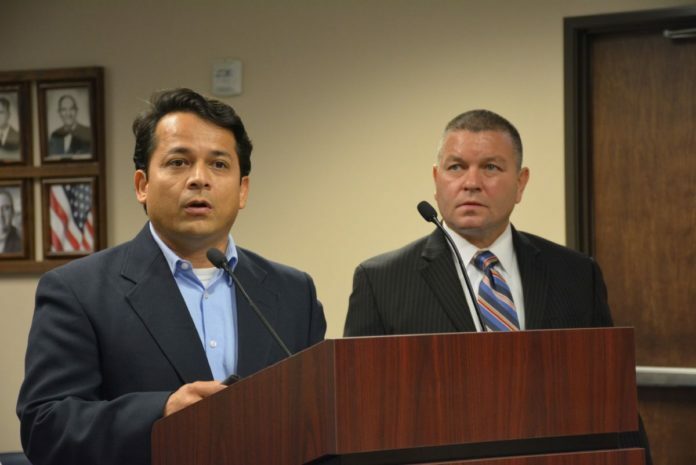 From left, UTRGV Assistant Professor with the Department of Manufacturing & Industrial Engineering Hiram Moya, and UTRGV Associate Vice President with the Office of Governmental Relations Richard P. Sanchez presented to the court a proposal to establish a U.S. Department of Homeland Security Center of Excellence. EDINBURG — The Hidalgo County Commissioners Court gave Hiram Moya his 31st letter of support for the University of Texas Rio Grande Valley’s application to establish the first U.S. Department of Homeland Security Center of Excellence (COE) in the Rio Grande Valley. Moya, an assistant professor in the department of manufacturing and industrial engineering at UTRGV, presented the proposal during Tuesday’s commissioners court meeting. If DHS approves UTRGV’s application for a Cross Border Threat Screening and Supply Chain Defense center, it would be the first COE to study the relationship between the nation’s food supply chain and homeland security. COEs are university-based research centers that study homeland security challenges and develop tools and technologies to address them. Although the center’s initial focus would be Mexico, Moya said it would eventually expand to studying land, air and sea ports of entry nationwide. Various UTRGV colleges would conduct research projects for the center, including the College of Engineering and Computer Science, the College of Liberal Arts, the Robert C. Vackar College of Business and Entrepreneurship and the School of Medicine. Other universities would also collaborate with the center, and the University of Texas at San Antonio, New Mexico State University, the University of Texas at Arlington, Texas State University, Lamar University and Mexico’s Monterrey Institute of Technology and Higher Education have already submitted project proposals. UTRGV will submit its application Friday, and DHS will announce the new COEs in March of next year. If selected, UTRGV would receive a $35 million grant over a 10-year period. The only other Texas-based COE is led by the University of Houston; its focus is on border management, trade and immigration.